In the middle of this Hollywood season it’s fun to remind ourselves to what degree Hollywood has come to resemble the clone it engendered, India’s Bollywood, endlessly recycling the same wine in different bottles. 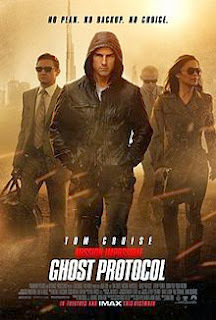 So Mission: Impossible—Ghost Protocol reignites the franchise. However if one believes that manifest content, that is the way people or things presents themselves,is a signifier of the cultural zeitgeist that goes beyond the hit and run catharsis of the action thriller genre, with its predictable chase sequences, then there are some are elements both ephemeral and eternal to be noted in this latest Mission. On the time sensitive level, the film is a meta cold war thriller, that is to say it engineers an almost fatal re-instigation of the cold war that is revealed to be the working of a rogue terrorist, out to produce a doomsday scenario. In the end, the Russians and Americans turn out to be simply combative bed fellows, both eager to forestall Armageddon at all costs and then there’s Tom Cruise's Ethan Hunt who has earned his stripes in another post cold arena, the Bosnian conflict. On a more long lasting note this last bit of plot leads to a rather charmed ending in which a supposedly dead person is brought back to life. Mission: Impossible--Ghost Protocol might be better called Mission Implausible (Ethan’s sidekick Benji played by Simon Pegg breaks into computer servers with preternaural facility while his boss engineers a Kremlin break-in and climbs up the side of the world’s tallest skyscraper in Dubai), but if the film is totally lacking in art or probability, it does recall, in tone and spirit, late Shakespeare plays like The Winter's Tale (remember the purportedly deceased Hermione magically appears) in which through a mixture of artifice and improbability tragedy is averted and the world set aright. Put another way the movie is an exercise in wishful thinking. Mission Impossible is an example of the willing dis-suspension of disbelief. None of it makes any sense.Yet if you were to do a skin respiration test of audience members, you’d probably find that the film gets more than a few hearts pumping.